Hulu today announced that subscribers will now be able to add HBO's programming into their Hulu subscription for $14.99 per month, as well as Cinemax for $9.99 per month (via TechCrunch). Hulu currently offers Showtime for $8.99 per month as an add-on package to the basic streaming service. HBO will be available as an add-on package for both Hulu's new live TV service (beginning at $39.99 per month) as well as its on-demand streaming tiers ($7.99 per month for limited commercials, $11.99 per month for no commercials). HBO's East Coast and West Coast live feeds will be available, as well as every show and movie in the network's back catalog. 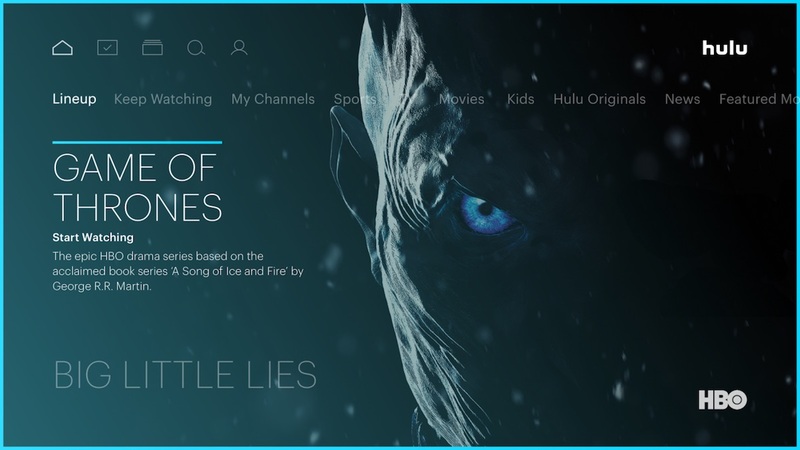 Those interested will be able to access HBO on Hulu's new app for Apple TV, iOS, Xbox One, and Android. Coming soon, additional HBO and Cinemax channels will be added, like HBO 2, HBO Family, HBO Latino, HBO Comedy, HBO Signature HD, HBO Zone, MoreMAX HD, ActionMAX HD, ThrillerMAX HD, MovieMAX HD, 5StarMAX HD and OuterMAX HD. Why would you do this when it costs the same to get HBO Now? Sigh. Wake me up in a few years when these services come down to earth. They are just all way too expensive. What baffles me is that TechCrunch and others are completely ignoring the UI debacle that has been going on with Hulu for over two months. The backlash from customers has been like nothing that Hulu has every seen or experienced. So uhhh.... why not just subscribe to "HBO Now" for $14.99/month? It let's you stream premieres live, etc without needing Hulu as the middleman. You wouldn't ... cuz it would be dumb. DIRECTV NOW taught me that +HBO should cost +$5. That was my threshold price. $15/mo is just dumb. It only took me a month or two to exhaust everything I cared to watch in HBO. And their monthly content added is NOT worth $15. That's more than the cost of NetFlix, and NetFlix offers/adds more content than HBO. Yeah I hate their UI. But they are stuck with it. Not like Hulu will change it anytime soon. The new UI on Hulu is horrible. Hulu's UI on the ATVs have never been great, but it looks like they have adopted Netflix's UI on the ATV4. Visually looking nice, but not very fun to navigate or use. One thing that I like that Hulu recently added was profiles. Using them on the ATV3 is very easy and quick, which curiously, Profiles on the ATV3 was updated a few months before the ATV4 app. Profiles on the ATV4's version of Hulu takes many clicks and swipes to switch, and with the goofy swiping of the Siri remote design, it is easy to accidentally swipe into something that you did not intend to go into (this is not just Hulu though). Anyways, I was interested in getting HBO for a few months while GoT is on, but I might stick with the HBONow app. This. It went from cluttered-but-useful to sacrifice-everything-for-pretty. With a propensity for things like showing thin-stroked white uppercase text on yellow backgrounds. Which is nice unless, you know, you want to actually read the text, much less parse it quickly. And screens mostly devoid of information (lest it obscure the pretty background picture), so you can see maybe 3 or 4 titles (programs or episodes) at a time - it's like using an interface with blinders on (imagine if you were limited in the Finder on the Mac to windows that only showed a 2x2 grid of icons, and you had to endlessly scroll to find things). This is a good description of some of the issues with Hulu and Netflix's UI on the ATV4. The apps are needlessly complex, but at the same time missing basic features. One of the feature that made the ATV3's Netflix app so great was the genres and sub-genres. Not too long ago, genres was added to the ATV4's Netflix app, but they are very broad, and not in sub-categories like the the ATV3 app. AN example would be Genres>Horror>Vampire Horror. This is one of many other issues with both Hulu and Netflix. And what does it cost to get just internet from Comcast? This will not be the same for everyone, but I switch back and forth every few months to a year between Comcast and FiOS. I do that to get the "New Customer Rates". I understand that I am very lucky to have more than one ISP available at my home, so I know not everyone can do this. Right now, I am paying $39 a month for 25Mbps downloads from Comcast. I could pay an additional $20 more a month and get 200 Mbps downloads, but I find that 25Mbps to be adequate for my very stream-heavy family. I do not rent my cable modem. Everyone likes to talk about "cutting the cord" and whatnot... but I never hear any real numbers. The problem with real numbers is that everyone situation is different. Some people are perfectly happy with the $8 Netflix account. Some people have to have sports channels. Some people would say that they must have the fishing channel (my brother), so they are forced/choose to buy one of the highest cable tiers. I don't like the argument against cord cutting that it will be almost as expensive as cable. Even if that was true, you would still be save some money. But in many cases, it is what people choose not to forgo that ends up making the total costs of cutting the cord so high. Another issue about cord cutting is the definition. It could mean so many things. Some people may consider cutting the cord as in no cable service at all. I personally believe that just getting an internet plan, with a bare-bones TV service included as cutting the cord. In many cases, it only costs a little more, and you can get a premium channel like HBO. Then you can get a streaming service like Netflix for most of your content viewing. I consider it cutting the cord, because the customer is not buying the expensive cable tv tier that the Cable Companies are so used to their customers getting. Also, a significant portion of many people's cable bills are the equipment rentals. IMO, one part of cord cutting is reducing/eliminating the amount of the equipment rental cost. I think that is what it comes down to, what a cable cutter is willing to forgo. People could save a lot of money a month by having only internet and Netflix. I personally get HBO and Showtime every couple months, either through my ISP/cable provider, or the apps. If it is from the ISP, I never pay full price, and many times, I pay $5 more for a lite-TV package with a premium channel. Add the family plan of Netflix, and the commercial-free Hulu, plus the Stars app every once in a while and my family never runs out of content. All while saving a significant amount of money over cable. More than anything this shows lack of Apple leadership in the media business; this type of convoluted bundling was supposed to be ditched and revolutionized by Apple long time ago. Time and time we are witnessing the poor performance of Apple's weakest link, Eddy Cue, who has lost ambition and needs to retire (don't get fooled by rate of growth of his department; he's just reaping the benefits of good hardware and software and increasing customer base). There is a lot of wishful thinking about what Steve Jobs would have done if he were alive; I don't think he could have done more on the hardware and platform side, but I am sure he would have seen the rise of Netflix and Hulu and alike earlier than many of us and would have put Apple Internet business on top of all of them using his cash hoard. Heck Hulu could have been an Apple offering long ago.